Culture: we cling to it as we do our identity. Alas, culture for many is their identity, their way of life. It gets more complicated with sub-cultures, whose niche must be filled perfectly and genuinely to be deemed real by already existing members. Sub-cultures, depending on whose, can be borrowed, shared, stolen, spit upon, mocked. Some take parts of a culture because they have none of their own; some have a rich culture of their own, yet take parts of another. It gets tricky deciphering who means well in the using, and if one can even “mean well” at all. 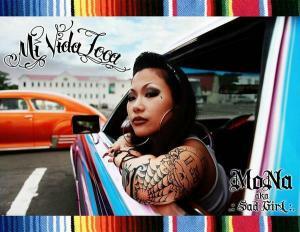 Take Mona a.k.a Sad Girl, a self-described Chicana rapper from the Lowrider scene…of Japan. The Dickies with the crease, the thick lip liner, the gold jewelry and flannels-stylistically, it’s all there. As I checked out her music videos, there was an abundant amount of lowriders, murals with a distinctly Chicano influence, and more Japanese homies in the background. Mona, it would appear, has been doing this since at least 2009, so she has been cultivating the same chola persona for about six years now. At least she’s been staying consistent? Now I am not a chola, but I can imagine that those who do resonate with the lifestyle might be flattered at best, and pissed off at worst, with ambivalence somewhere in the middle. I know when I first saw Mona, I was completely taken aback; here is this Japanese woman dressing straight up chola, gold name plate earrings and all. If you read Vice’s recent article(http://www.vice.com/read/the-history-of-the-chola-456) about the struggle behind the chola trend, you understand that those who really do live the lifestyle are frustrated by outsiders who have taken the chola aesthetic and turned it into more of a costume than a way of life. When Mona dresses like this, and stylizes her music videos and songs to sound more old school, is she trivializing this sub-culture? This sub-culture was born from a way of life dealing with “gang warfare, violence, and poverty on top of conservative gender roles,”(Calderón-Douglass) all of which we don’t know if Mona has lived. Maybe she has. But even if she has, can she legitimately borrow the chola aesthetics if they were created from social issues that never directly affected her? See how it gets tricky? I am definitely for identity expression, and I believe if Mona is so immersed in the lowrider scene, that she genuinely respects it and isn’t using it as a trend, then what’s so wrong with her lipliner and creased pants? But then again, I see the other side: If she was never brought up in the lifestyle, how is it suddenly hers to take up and personify? Growing up in Kyoto, Japan, does she truly know the struggle of not being accepted by mainstream white-American society, and thus rebelling with a non-conforming style? Tumblr post that caught my attention. I need to address a few things. I will start with the first paragraph, which claims Kahlo had only one Indigenous relative among her ancestry. Clearly the author of this post has not done proper research on Kahlo. 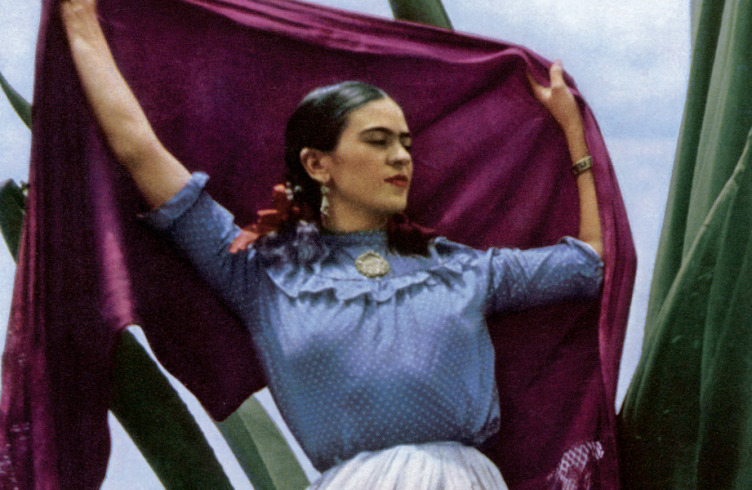 A well-rounded Google search, or even a search among credible books, will show evidence of Kahlo’s maternal line as legitimately Indigenous, albeit mixed. 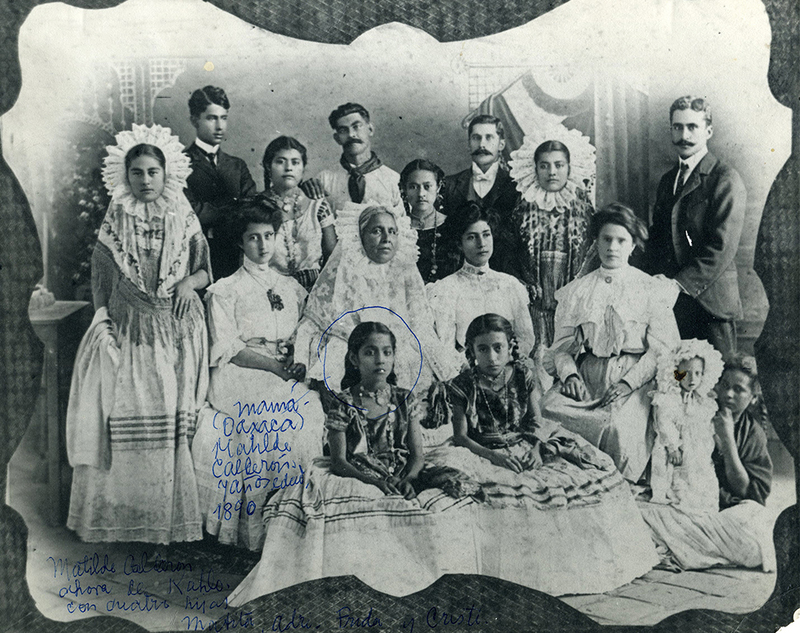 (input photo of her mother and family) One can see her mother as a young girl, seated with her Mestiza family, dressed in the Tehuana style that is from the Mexican state of Oaxaca. This is an elaborate style of dress that the Indigenous women of the Tehuantepec Isthmus wore, including a heavy headpiece adorned with flowers, ribbons and pleats. Even more significant is the huipil, which depending on the design, designates the community that the woman is from. We have seen Kahlo in this style of clothing many a time; one can go as far to say this is one of Kahlo’s trademark garments. 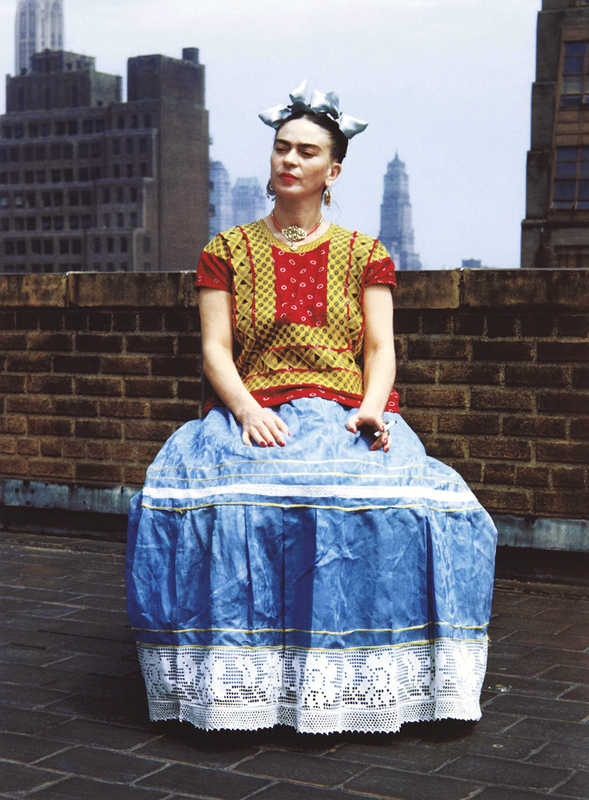 Kahlo sitting regal in her huipil, skirt, and headpiece. This manner of traditional dress is unique to the area Kahlo’s maternal family is from; I ask now, how can Kahlo appropriate a style of dress that is so clearly documented to actually belong to her own family, her own ancestors? Let us acknowledge the fact that Kahlo is clearly mixed with German and Jewish ancestry, along with Indigenous. Let us also acknowledge that many present-day Native people are also just as mixed. But what about the present day people that are 100% Native, yet have never known the plights of poverty… do they not get to wear traditional clothing of their ancestors? Now where do we draw the line of who can wear what? Every Indigenous person, whether full blooded or not, whether from North America, Central America, or South America, has suffered at the hands of colonialism and experienced the genocide of their culture and communities. I can give you an example of our Native people of Southern California, commonly known as The Luiseno. First off, ‘Luiseno’ was the name given to us by Spanish missionaries- this is not the name we called ourselves. The Spaniards not only took our real names, they physically took our people; They took away our traditional religion, forcing our ancestors into Catholicism, and then they enslaved our people to build their missions for said Catholicism. Our ancestors were tortured and died at the hands of Spanish missionaries, and with it much of our culture died as well. Presently, I can say with pride that not all of our customs are gone. In fact, many of our sacred funerary songs have been passed along. But that is only a fraction of the cultural wealth we had; Most of our ceremonies, including boys and girls initiation rites, didn’t even make it to the 21st century. And so now I hope you understand more clearly that if I wear a skirt made of yucca that my Indigenous ancestors wore, I wear it in honor of my ancestors. I simply won’t stop wearing it just because I’m not fully Native. I simply won’t stop wearing it because I have been blessed with an easier life than my ancestors. I will wear it because it is one of the last pieces I have left of my culture. Am I just to leave my traditional clothing in the past because present days are uncomplicated for our people? No, that would not honor my ancestors. That would make all the songs, the words, the ceremonies they protected for future generations die in vain. And so where am I going with all of this? The great debate surrounding culture is who is allowed to delve deeply into it, and who is really just appropriating it. Who is giving it the respect it deserves, and who is just shitting on it. It’s easy to discern those that do the latter: Non-Native people at festivals wearing headdresses, race imposter Rachel Dolezal, Katy Perry dressed as a Geisha etc. Where it can get tangled is when we examine the former. When people seize aspects of a culture not their own, regardless of the high esteem they give it, they are in danger of exploiting the people themselves. To me, it’s easier to deduce this conundrum by comparing and contrasting the Japanese Lowrider scene (essentially Mona a.k.a. Sad Girl in this article) to Frida Kahlo. Mona is paying homage to the Chicana/o Lowrider scene by using the aesthetics in her music videos, her daily wardrobe, and alas her life itself. Even though she is Japanese, one can ascertain there is a level of respect for the Lowrider scene. Similarly, Frida Kahlo’s style of art, clothing, and home aesthetics gave life and paid homage to her Indigenous Mexican heritage. The difference being, that Kahlo’s family is obviously actually indigenous to Mexico, while Mona is indigenous to Japan. Likewise it’s true that Kahlo was never in poverty like her same people were/are in, and she did have the privilege of healthcare and education that many never had access to. This is also true of Mona; living in Japan, she has never experienced the Chicana/o lifestyle of combatting white American society with a culture created out of defiance and strength. One could even argue that living in Kyoto already grants Mona a Japanese culture rich in its own right, so why does she need to take up another? One striking difference that I think we need to pay attention to is that while both Kahlo and Mona grew up with privilege, Kahlo still has concrete Indigenous roots. I feel for Kahlo, as many Indigenous people do, because Indigenous blood runs through our veins, and being mixed does not take away the fact that the genocide of our culture and people truly did happen to us; if anything, being Mestiza is a result of that genocide. It is a profound shame that whoever wrote that initial Tumblr post (and those who believe in it so heartily) thinks that being mixed takes away the right to celebrate their roots. I will agree that having one ancestor down the line does NOT in fact make one Native, or Black, or Polynesian(that is another article in itself), but we must acknowledge that in Kahlo’s and many other mixed peoples’ cases, that the admixture is real, regardless of if these people went through the same hardships as their ancestors. 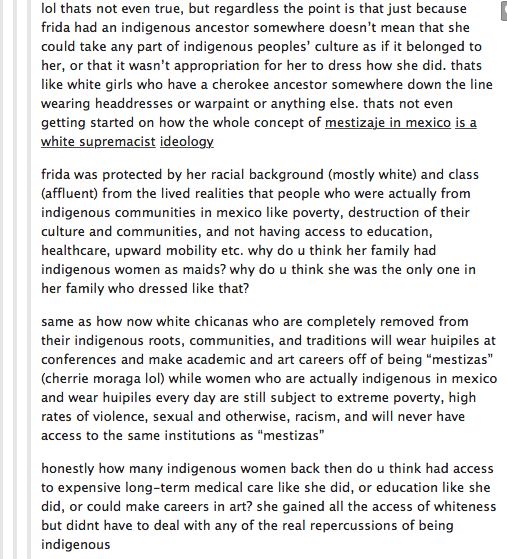 By using the logic of the bitter Tumblr poster, are we as Native people to deny and forget what culture we have left because we never directly experienced boarding schools, missions, and poverty? And furthermore, are we not still experiencing the affects of these traumatic experiences in the form of loss of our languages, customs, worthless healthcare systems and the like? Because think about it; through powers not of their own, many contemporary Native people live healthier lives than their previously assimilated ancestors did. That should not negate their cultural relationship to those ancestors. At the same time, many Indigenous people still do live in poverty, and that is something that Indigenous people with certain privileges (wealth, health, etc.) should address and work to change. I still don’t know how to soak in the Japanese Lowrider scene, and am honestly not sure I have the right of doing so myself. But I will say that Frida Kahlo did something that conjures up feelings of unity and identity inside of me; she beautifully embraced her Native roots, and by doing something as simple as wearing her huipils, she reclaimed an identity that colonialism would have killed. By choosing to use her peoples’ traditional aesthetics, she is re-planting and re-affirming the seeds of her people. Kahlo used her platform as a Mexican artist to paint images of its Indigenous people, people that were rarely represented at the time. To me, that is the furthest thing from cultural appropriation; that is cultural revival. I hope that our generation of legitimate Indigenous people never become discouraged or shamed by others for continuing their ancestors’ traditions, and fighting for their peoples’ rights. One thing I know is this: Cultural Appropriation is NOT when an actual Indigenous person, previously disconnected from their roots, decides to reconnect with them. Calderón-Douglass, Barbara. “The Folk Feminist Struggle Behind the Chola Fashion Trend.” Vice. Vice, 13 Apr. 2015. Web. 17 June 2015.